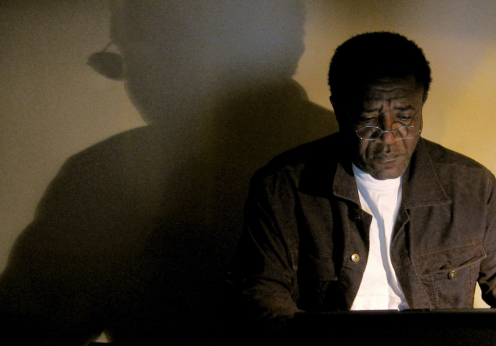 SKYPE Q&A with director Balufu Bakupa-Kanyinda after the screening! Juju Factory – An intelligent commentary on exile and migration, Belgium’s colonial history, racism in Europe, the psyche of the colonised and the de-colonised…Kongo lives in Brussels, in the « Matonge » district on which he is writing a book. His editor wants a kind of traveller’s book spiced with ethnic ingredients. However, the writer is inspired by the vision of complex and tormented souls that he meets at all crossings. Kongo Congo follows invisible ways connected to the Congolese history and its ghosts. How is it possible to stand upright in this chaotic history ? By having the « juju », self confidence, and Beatrice’s love. BALUFU BAKUPA KANYINDA was born on 30 October 1957 in Kinshasa (DRC). He studied sociology, history and philosophy in Brussels, Belgium. He took courses in filmmaking in France, the United Kingdom and the United States. From 1979 to 1981 he was an instructor in the French Cultural Centre in Lubumbashi. In 1991 he made his first documentary, Dix mille ans de cinéma, and in 1993 released a second documentary on Thomas Sankara. His first fiction film was Le Damier – Papa National Oyé! (The Draughtsmen Clash) made in 1996. He was a member of the board of short films at CNC in France from 1999 to 2001. Balufu was a member of the Input 2000 (International Public Television) in Cape Town, South Africa and a member of CreaTV, UNESCO’s program for televisions in the South between 2000 and 2003. Bakupa-Kanyinda is a writer and a poet as well as a film director. New York University invited him to lecture in 2006/2007 at the NYU-Ghana campus in Accra. Balufu is a founding member of the Guild of African filmmakers and producers.